Irvingia glaucescens Engl. ; Desbordesia soyauxii van Tiegh. ; Desbordesia pierreana van Tiegh. The tree reaches a height of 46 m, with diameters up to 100 to 170 cm. The bole is straight, clear, cylindrical, up to 23 m in height. As the tree grows older, the small but well developed buttresses hold the tree upright. Desbordesia glaucescens occurs in alluvial areas, in dense evergreen forest and in transitional formations. Wood diffuse porous. Occasionally vessels exclusively solitary (over 90%). Tangential diameter of vessel lumina 200 micras or more (large). Non-vestured pits. Vessels per mm2 less than 6 (rare). Simple perforation plates. Vessel-ray pits larger than the interve Axial parenchyma in continuous tangential lines or fine bands. Prismatic crystals in short chains in chambered axial parenchyma cells. Over 9 cells per parenchyma strand. Axial parenchyma bands more than 3 cells wide. 4 to 10 rays per mm (medium). Rays non-storied. Rays 1 to 4 seriate. Body ray cells procumbent with one row of upright and/or square marginal cells (Kribs-III). Non-septate fibers. 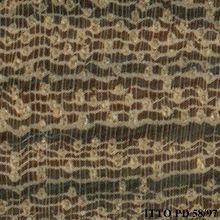 Fibers with simple to minutely bordered pits. The sapwood is yellowish to pale brown . The heartwood is pale brown with some dark veins, it is not clearly demarcated. Straight or sometimes interlocked. Usually interlocked grain is absent or very slight, without any effect on further processing operations. 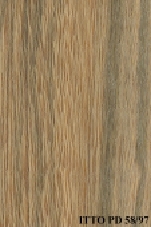 The wood is frequently reported to be fine textured. Very durable to decay; without preservative treatment. This species is especially suited for all the uses with risks of permanent or long-lasting humidification. Resistant to termites attack. Heartwood is resistant to Lyctus attacks. For this species no growth stresses are reported. Ease of Drying: Drying is rather slow and sometimes difficult to perform. Drying Defects: Risks of casehardening and checks Kiln Schedules: The kiln schedule has been tested. Rather difficult; special tools are needed.